Being a journalist is a great career if you want to be a writer, apply your analytical skills to a topic you’re passionate about and want the rewarding feeling of connecting with people and touching their lives. If you’re thinking “I want to be a journalist“, you’ll enjoy today’s videos which are full of journalism career information and advice. Our guest is Maria Elena Fernandez, who writes about the exciting television industry as a staff reporter for the Los Angeles Times. Maria Elena Fernandez shares great career advice for young writers in today’s videos. She says there are many types of jobs in the journalism field: from online writing jobs to magazines to reporting for your local community newspapers and major city newspapers. If you want to succeed, she says you’ll need to be a quick thinker with good listening skills who is persistent, aggressive and has a thick skin! Maria Elena advises to start writing as soon as possible – write for your school paper, get journalism internships at your local community or city paper, and be able to produce writing samples from a variety of sources – these will prove you can do the job. Maria Elena says you should take as many journalism classes as possible – but if your college major is on another topic, your expertise in that other area may actually serve you well. If you’re thinking “I want to be a journalist,” Maria Elena strongly advises that you focus on networking and building your network before you need it – get involved in whatever journalism organizations you can – there are a wide variety out there. For example, as a Cuban American, at a young age Maria Elena became active in the National Association of Hispanic Journalists. Her past few jobs at major newspapers came to her via the relationships she developed through that organization! She talks about this in our video about hispanic recruitment. If, like Maria Elena, you have a diverse background or life experience, she suggests you look into opportunities like the Tribune Company’s Metpro training program. Careers Out There Host Marc Luber: Hey everyone – welcome to Careers Out There. I’m your host, Marc Luber, and we’re helping you find a career that fits you. Today we’re looking at journalism careers and our guest is a reporter for the Los Angeles Times. She’s the TV reporter there – and her name is Maria Elena Fernandez. She’s got a lot to tell us about journalism careers, so it’s gonna be a great show. Stick around! [theme song] OK we’re back – Maria Elena, welcome to Careers Out There. Journalist Maria Elena Fernandez: Thank you. Host Marc Luber: As a journalist who covers television, what angle do you take? You’re not a TV critic – you’re not like Roger Ebert saying whether this is worth watching or not worth watching, right? What angle do you take when you’re reporting on television? LA Times Writer Maria Elena Fernandez: Yeah, that’s true. I’m not a critic. I am a beat reporter, which means that I cover the industry. My particular focus is content. We have several people at the LA Times that cover television and different aspects of television. My particular focus is programming and the content so I write more about the shows and the actors and the producers and the people behind the scenes than I do the executives and the business stuff going on at the networks related to the shows. Luber: So it’s like the human interest stories? It’s kind of that angle? LA Times Reporter Maria Elena Fernandez: Yeah. You know I write a lot about shows that people love – shows that are popular – shows that are for whatever reason in the zeitgeist – you know, like Glee, for example at the moment is a phenomenon. Or the downside is I’ll write about a show that’s not doing well at all and why. It could be a behind the scenes human interest story of the director or the producer. There could be an interesting angle going on with an actor. It’s a lot of trends. I try to look at a lot of things that are working across the board, whether it’s on the broadcast networks or the cable networks. There are things that networks have in common. Reality TV right now is HUGE. A lot of those personalities we cover a lot. So I basically write about the things that the TV viewer, TV fan is interested in. Luber: OK – so through that you probably have some pretty fun experiences that I’m sure a lot of people would want to hear about. Tell us some of the craszie4rt things – tell us some of the wackier things that have happened in the course of hanging out on the TV set or hanging out with TV stars. Maria Elena Fernandez: Well I’ve done a lot of really fun things. There aren’t many people that can say they’ve gone horseback riding with William Shatner. It’s always when you’re interviewing an actor for a story about the actor, it’s always great to have time with them in a place where they’re comfortable and that’s outside of work so they can be themselves. And in the case of that story on William Shatner, he took me to his ranch which is about a couple hours from Los Angeles. He loves it. He rides his horses all the time. So I went there with him for that reason but you’d never – some of the things that actors or celebrities want to do on their off time during an interview are really crazy! Like Jimmy Kimmel insisted on taking me to Costco! Because that was his favorite thing to do on a Saturday afternoon! And I have to say, I had a great time! It was actually one of my favorite afternoons with someone famous. You know, it can be something as simple as just lunch – you know, a lovely lunch with someone. The best times are always when they’re alone. Some interviews are really monitored by their people – by their publicists or their managers, and so you never feel like the person ever really relaxes and you don’t really – that’s where you only get a snippet of them. So – let me see – I’ve been covering it for 7 years so there’s a lot! I’m trying to remember. Luber: Did Jimmy buy anything wacky at Costco? Maria Elena Fernandez: Did he buy anything? Well he was actually buying a lot. He throws a huge Superbowl Sunday party at his house every year and this was the Saturday before. I remember we had 2 cart loads and I think he spent like $2,000 or something like that! Mostly in meat and things because he loves to cook. And he throws a good party, from what I’m told. Sometimes it doesn’t go so well. Sometimes actors are not in a good mood or they’re just not interested in the press that someone has set up for them. You don’t always get to go on a nice horseback ride and have a nice lunch with someone. Luber: Right. Well tell us this – so you were not always reporting on television. You’ve written about a lot of different things. Tell us what you were doing before you were writing about television and how did it compare? Maria Elena Fernandez: Yeah, I’ve only been a TV writer for 7 years. Before I came to LA, which was 11 years ago, I was on the news side of all the other papers that I worked at. So I covered hard news and mostly crime and courts. In my early years, I covered a lot of general things, which is a good thing for young journalists to do – which is to basically try a little bit of everything to figure out what they’re good at and figure out just how society works and government and all kinds of branches of government. But by the time I got to Atlanta, I was specializing in crime and courts – and I did that for 7 years in Atlanta and D.C. And that was really hard – it’s probably the most difficult thing I’ve ever done in my career. Luber: Tell us an example – what does that mean? Writing on crime and courts? Explain what that is. Maria Elena Fernandez: Well being on the crime beat means that you’re basically following the police. You’re going to crime scenes but you’re also covering the police department. So sometimes the police get in trouble themselves! So you’re building a relationship with the people in the police department because they help you with the crime stories but you’re also keeping an eye on them and making sure that they’re doing their jobs well. That means you’re on the street a lot and it means you’re seeing the worst the world has to offer in many cases. Basically what a cop sees in his everyday life. You meet people at the worst times in their lives when they’ve lost a child or their husband or somebody got run over, somebody got hit by a car, somebody got shot and killed, a drug deal, over love or money….and it can be really really really hard. You definitely take it home. And you have to learn to release that or you could be in trouble yourself – you see that with a lot of police officers. Luber: Share that story you were saying earlier about when you were in DC – that horrible scary moment that you had. Maria Elena Fernandez: Yeah, that’s just one of the many huge crimes that I’ve seen. My first day on the job at the Washington Post, there had been a serial killer in D.C. killing prostitutes for their drugs and I think there had been like 7 murders up until then. I got there on either the 6th or 7th murder, I think. And it had just happened that morning and when I got to the crime scene, it was really gruesome. The only thing you could see was her torso – that’s all that he left on the sidewalk. In broad daylight on a beautiful January day…it was…. Maria Elena Fernandez: I have many stories like that – that’s the problem! Luber: It takes years of therapy to remove something like that. Luber: Now you’re not like the journalist character on Dexter, right? Where your father’s a serial killer and you’re kind of…. Maria Elena Fernandez: Oh no no no! Luber: OK – just want to make sure! So would you say that there’s a lot of things that both paths have in common, whether you’re writing about crime and courts and television? And what would that be? What should all aspiring journalists know? 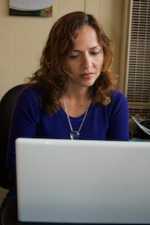 Maria Elena Fernandez: Yeah – covering courts means covering trials and hearings. Once the cases have moved on, which then you get to see society in a different way. You kind of get to see that drama play out in front of you. Whatever happened that day is going to be all recreated. It’s a very interesting place for a journalist. And those skills, I think definitely help – once I moved to Los Angeles , I made the decision to move into features. So a year after I was here, I moved from the news side into features and eventually into entertainment. And I think that the skills that a journalist needs that are germane to any job, is you have to be a quick thinker and curious and a very good listener and someone who processes quickly. So whether you’re using that because you’re at a crime scene where 3 people have been violently murdered, or you’re on a set and you only have 6 minutes in between a break to get 3 key interviews and you have to really put your brain on, basically, so that you know, “OK – I only have 6 minutes for 3 people – what are the 2 main things I need for this story” – at the same time that you’re observing everything around you because what makes features interesting is all those little details – things that you notice and somebody else might not – that make the story come alive and make it like you were there too. So one thing feeds into the other, definitely. I think that my news background has helped me a lot. Luber: So to a certain extent journalism is journalism. Maria Elena Fernandez: Yes – journalism is basically – at its most fundamental is the pursuit of the truth. So whatever the truth is. What’s the truth today on the set of Dexter? Or what happened to this poor woman that’s dead on the sidewalk? Luber: Right. Interesting. So what’s a typical day then for a journalist? How does your day go? Maria Elena Fernandez: That really has no answer. For me, let’s say now on the TV beat, because blogging is something that’s become a big part of what we do in journalism in the last few years. My day in the morning is spent scouring the internet to see if anyone else has – any other outlets – media companies – have put out any stories that are TV related that our readers might be interested in that I didn’t know about – and posting that. But the day really varies. Friday I’ll spend the entire day on the set of Dexter…..I may have spent a whole day on phone interviews. Sometimes that’s all you can get – the actor’s not in town or you’re trying – I’m actually trying to turn around a story really quickly for tomorrow morning – that I’m trying to get 2 phone interviews on. That’s not something where I spend the time to go on set and spend hours on….I’d just have 2 brief conversations and turn the story out that way. So there isn’t really a typical day. And I think that’s to me the best part of journalism – is that 21 years into it it’s still – every day – I don’t feel like today was like Friday was like Thursday was like Wednesday – because I’m talking to different people all the time and meeting all kinds of people. Luber: So you’re doing the phone calls, you’re going on the set, you’re meeting with people, you’re taking notes, you’re writing….do you already have a deadline set by an editor who’s saying “go out there, do this story, figure it out, pull it together by midnight”? How does that all come together? And do they then kick stuff back to you and say “redo this part”. Maria Elena Fernandez: Yeah. That also really depends on what situation we’re talking about. For example, the blog is something that the reporters are generating more on their own because it’s just so much content. So when you have something to post, you pretty much – like when you have a good little tidbit of a story that you just want to put online really quickly, there’s not a whole lot of conversation with an editor about that. They want that kind of news to be up fast because we’re competing with all these other television blogs. So in that sense, I’m more independent. If I get the interview, for example, that I said I’m waiting for, which is related to Sons of Anarchy, I would just post that. And it’s not really something that an editor and I discussed. The set visit for Dexter is a more complicated thing because it’s also going to be a feature in the Calendar section, which is our entertainment section. So I’m going to do a video for the blog but I’m also going to go and do a lot of interviews and report out a feature for the paper – and that is something that we talked about in advance. And the deadline for that will not be a rough one to me because I have 2 weeks before it premiers. So that’s a lot of time. Sometimes you have to turn it around – like a week ago I had to do a high profile interview with someone – I did it on Wednesday night and it had to be in the paper Friday morning. So that was really hard. Not really hard but really fast – and I had to work overnight to get it done. Luber: So do you determine sometimes? It sounds like you make the determination that this is good for the blog or this is good for the paper? Maria Elena Fernandez: Yeah. And I mean I have that because I’ve been doing it a long time and I’ve been at the paper a long time and so they kind of know that I know which kinds of stories would go for the blog and I may mention it – like when I get the idea – I may mention it to somebody and say “hey I’m waiting for this because I think it will make a good story” but it’s not the kind of thing where there’s a lot of back and forth. To answer the rest of that is once I go to Dexter and I write the story, yeah – it goes through the editing process and they may send stuff back to me to change or for space reason – which is a big thing we’re facing now on a regular basis – stories are shorter now because the paper is smaller – we may need to cut it if I didn’t do my job right and I sent it in over. They may have to kick it back and cut it. So in that sense it’s a big collaboration. After my editor’s done with that, it goes through another process of copy editing and that’s a whole other level where those editors may have questions or that’s more things that need to be cleared up – maybe they thought something was confusing or there’s a misspelling or something like that…at that level…then there’s more changes. So there’s a lot of people involved with a story before it goes into the paper. Luber: A lot of moving parts, it sounds like. Luber: Keeps it exciting! So what about the most rewarding aspect of this? What would you tell someone who’s considering a journalism career? What’s the most rewarding aspect? Maria Elena Fernandez: Well I think that you have the opportunity to make a difference in someone’s life. Granted, sometimes people aren’t happy with the difference that you’re making in their lives. Let’s say you discovered that the mayor is embezzling or something like that! That mayor’s not happy with that but the public is – the people he serves and the people of Los Angeles – learn something that they needed to know about this person that’s representing them, right? And where their money’s going. So always – you know – even in something that may seem like a simple feature about a show – like let’s say the new season of Dexter. That’s not life changing or deep in any way but for the people who watch that show, they’re going to learn something they didn’t know about and it’s going to enhance their viewing of it. So maybe I didn’t make their lives better in some substantial way that I improved it, but as far as their entertainment value, when they’re watching the show they’re going to see it with different eyes. And you feel you can contribute to society in that way. Obviously I don’t feel it as much as I did when I was covering news. There I felt it all the time because the response that I would get and the reaction that I would get – especially from when I dealt with murders and the reactions I would get from family members and people. Even if the person that died was a horrible person in a gang, let’s say, who had been wanted on many other crimes and he just happened to die in a gun fight that was gang related. He still had a mom and a sister or a friend who loved him and so you came into contact with people on that very human way. I feel like there aren’t many jobs – maybe teaching – maybe a doctor – there aren’t many jobs where I think you feel like you’ve connected with people and made their day better or at least helped them to understand something in a much more substantial way. Luber: That must be a great feeling to know that the stuff you’re putting time into, you’re crafting the words and you’re putting this whole story together – people are seeing it! It’s ending up in either their hands or their computer screen and they’re reading your work. So that has to be a really rewarding aspect of it. Maria Elena Fernandez: Yeah. If you go into it because you love to write, if that’s any part of your motivation, that’s the scariest part – putting yourself out there in that way – and then having editors edit it and have an opinion. And now on the internet, people blast you left and right for anything! It’s like everyone has a say and they just press send! You have to be very thick-skinned! That’s something I should have said about journalism. You have to be very thick-skinned. But at the same time I love that about the internet! Because I instantly know what people are thinking about what you wrote about or the topic or what they thought of what you said about it. I think that’s very rewarding. Luber: What would you say is the most challenging aspect, then? Is it some of the stuff you just touched on or is it something else? Maria Elena Fernandez: The most challenging is how much competition there is. There’s more than ever because everyone’s a writer and a photographer now on the internet. So the most challenging thing is to have original things to say or to share because there’s a lot more people doing this job, even though they don’t call themselves necessarily a journalist – or they didn’t go to journalism school. Luber: What would you say is the top thing where you could weed people out? If you can’t handle this challenge, if you can’t handle this aspect of it, get out of the room! Don’t even consider a journalism career! Maria Elena Fernandez: I think there’s 2 things. I think there’s pressure – because you’re on constant deadline and you’re constantly – you come up with something great today and the next day your editor wants something else already. There’s like this constant pressure to be churning. And the other thing is that if you can’t be thick-skinned, if you can’t learn to put aside your personal feelings and listen to criticism and listen to what others have to say about the idea that you’re pitching or something that you wrote, then you should not do this. Because it’s hard! Not everything you think and write is going to be met with a smile and a green light! Luber: Exactly. It keeps you on your toes! Luber: What about personality and skills? I feel like you’ve pretty much covered it but are there any other aspects as far as certain personality types that are really right for this? Or certain skill sets that are really right that you haven’t touched on? Maria Elena Fernandez: I think that maybe we haven’t talked about analytical skills are really important. Having a very good b.s. detector is very important. That’s why I was saying to have good instincts – to kind of be that person that can quickly assess a situation. Not all journalists are super outgoing, even though you’d think that they would be. Not all of them are. That’s fine. There’s some journalists that are lot shyer and more serious and introspective and other people that are more gregarious and outgoing. I think either one of those styles works. I think that as long as you’re someone that can make people feel comfortable, then you’ll have success. Luber: Got it. So that the communication skills and people skills are big. Luber: What about school? What types of majors and educational backgrounds would you suggest to people who are considering this path? Maria Elena Fernandez: Well I went to journalism school but that’s not necessary at all. You definitely need an education but there are people who have business degrees, people who have history degrees, political science degrees, some people get a communications degree but then they get a Master’s in culinary arts or film studies or whatever they’re interested in covering. Music. Education-wise there really is no one path because in journalism you’re constantly learning anyway. And I think a person who is exposed to a lot of different things who either tries to have internships in various cities across the country or can study abroad and specialize in something abroad…something that makes their background richer and diverse and interesting will definitely benefit them. Luber: That’s great. I like the story you were telling me – tell everyone really quickly – your major. How you were starting out not as a journalism major but something changed that. Tell us that story really quick. Maria Elena Fernandez: I was convinced I wanted to be a lawyer after high school. I went into business school thinking I’d go into corporate law. First business school and then corporate law. My freshman year, I had always been a really good student in school, and my freshman year at college I was not doing so well – I was just doing average – I was not happy. And my English classes were the only ones – I had taken my regular English freshman class but then I was also in a creative writing class – and in that class my teacher noticed that there was something off about me. And we had a chat about writing and she told me she thought that I had a talent or a gift and had I ever thought about pursuing that? I had always loved writing and I’d always loved the news. I’d always paid attention to the news and read the paper but I hadn’t thought about becoming a journalist. And she just kind of threw that out there and said, “get a job at the school paper – go write a few articles, see what you think, take a couple of classes – you never know – you can always get a journalism degree AND go to law school but get out of business school!” And so I listened to her and I went and got a job at the school paper covering the business school and found that I just really loved the whole process of reporting and meeting new people and getting them to talk about different things. I really liked it. I enrolled in the journalism program and 21 years later, I’m still here! Luber: Yeah – I love that story – because it’s great how that one person can make such a big difference in your life and you just never know! Maria Elena Fernandez: Yeah – totally! Totally! I think about that a lot. Maybe I would have gone through with a business degree and later in life I would have discovered I wanted to be in journalism but it would have taken me that much longer and she saw something in me that I hadn’t seen in myself yet. So that was great. That was great. Luber: Yeah. That’s great. I have a story on the website – on Careers Out There – where I met with someone at University of Michigan when I was trying to figure out what major to jump on to. I had no idea. And he sat me down and he said “what is it that you’re really passionate about – what is it that you always loved doing since you were a kid?” And the answer was “music”. And he steered me on a course towards the music industry! I had never thought about doing that – I had never thought “well let me think about what I’m passionate about”. I just thought you do whatever it is you’re supposed to do in school. I didn’t know. Luber: But having that one person sit you down and talk some sense into you can really make a huge difference. So I love your story. Maria Elena Fernandez: Yeah, I think you feel a lot of pressure when you’re 16 or 17, that you have to decide now what you want to do with the rest of your life. And that’s almost impossible! Luber: It’s tough – people just don’t know – you’ve got to experience things! You’ve just gotta go for it. OK, so let’s talk about diversity. As a Latina American woman, I think you have a special perspective that you can share. And how it’s played a big role in your personal path. So I’d love you to share what role being a Latina American woman has played so that the people who are watching who are minorities of any kind – anyone who’s not a white male – can listen and really learn from your experience. Maria Elena Fernandez: Well I think that being Cuban American opened a lot of doors for me early on. One of the things that someone told me – an editor gave me this great advice early on – he said I should join the National Hispanic Journalists Association – that I would meet a lot of people that way – that I’d be able to network with top editors from other papers and go to the conventions and take classes and things like that. So I did join – and as a result, pretty much every job I’ve had since I’ve left Florida has been as a result of people that I met at these conferences that I kept in touch with, remembered me, and took an interest in me and basically tracked my career. My job in Atlanta that way, my job in D.C. happened that way and I wound up at the LA Times that way. So I think that I came out of school at a time when affirmative action was just becoming what it is and a lot more eyes were on it and people were opening up to the idea of making newsrooms more diverse and I benefited a lot from that. It’s what you do with it once you’re there too because you have to work really hard. I feel like it was kind of like a double edged sword when I was younger. Now, not so much. But when I was younger, because you came in and it was assumed you were there as an affirmative action hire and that’s the only reason and you kind of had to work harder to prove yourself. To prove that you deserved to be there for other reasons. I don’t know that that’s so much the case anymore. I think it’s evolved and times have changed but this was at the very beginning. In addition to joining organizations like the National Association of Hispanic Journalists, there’s NABJ for African Americans, there’s an Asian American….there’s all kinds of groups. I strongly recommend that because not only do you meet people but there’s opportunity for training and seminars at these things and you just get exposed to a lot of experienced people that you can learn a lot from. A lot of the bigger papers especially have programs – the LA Times, for example, has a program called the Metpro (www.metpronews.com) program which is basically – they offer a 2-year job at the LA Times. You get exposed to a lot and you work a lot of different departments and in many cases it leads to full-time employment afterwards. But at the very least, it was a job at the LA Times for 2 years, which can open a lot of doors elsewhere. Doing your research and learning about those kinds of things is really important too. America is getting more and more diverse as time goes. As we can see – in the White House we have President Barack Obama – so there’s a lot of opportunities everywhere. And it’s just a matter of being able to do a little research and figure out where the niches are – that might afford you a new door opening and a whole different career level. It can seem a little daunting but I did it straight out of school – I got myself involved in these kinds of organizations. It’s really worth it and anyone can do it. Luber: You’re in an industry that’s changing so much. We all hear about how the print industry is just falling apart. We’re all seeing newspapers disappear, we’re learning how less and less people under 30 even buy a newspaper. You’re doing more and more for the blog instead of the newspaper. What’s it like to be in this industry right now? And what do you see happening for people who want to get into it for the future? Maria Elena Fernandez: Well knock on wood I still have a job! That’s been the sad part – we’ve lost a lot of positions around the country and a lot of journalists are out of work. Working in the industry right now for me is very exciting. I know that a lot of people feel very stressed out and intimidated by all of the changes. And by the changes I mean we’re working a lot more on the internet, hours are grueling because you can post a story at any time of the day and night now and you’re expected to be available most of the hours of the day. But by the same token, I think what’s exciting about it is that there’s all this new technology that’s giving you instant access to your readers, which you do have before. You have a much more personal relationship now with readers – and that can be good or bad! Because they will call you out and curse and say nasty things about you and your mom! But it’s exciting to me because as the world has moved into the internet and everything is so fast, and there’s a lot of competition from people who aren’t necessarily trained journalists because everybody can be a blogger and everybody can be a photographer. What’s exciting is that those of us who do have the experience and do have the skills and the credibility can make a name for ourselves in a way that I didn’t have in the newspaper. In the newspaper, I was very much a part of the LA Times – and on the internet I can exist much more as my own brand. And I like that. As a writer I like that very much. What it means though is that the skills that you needed, which were to be curious and to be fast-paced and a fast-thinker and all those things – now it’s to the umph degree because to get things on line, it’s like yesterday. I mean not like yesterday but like 10 seconds ago was too late – it had to be now because you want to be first. And you’re having to blog, which doesn’t give you the time it used to. When you were reporting the stories and thinking about the news for the next morning, it was pretty crazy when you were doing this at 8:00 at night. Let’s say a story broke at 5:00 in the afternoon and the newsroom is nuts and it’s 8 or 9:00 and you’re trying to put this together for the next morning. Now you don’t even have that! You don’t even have those hours! The story breaks at 5 and by 5:06, you want to have something on line or somebody else is gonna have it! So there’s the challenge of thinking and writing fast – but also verifying the information. We are the LA Times – I’m not just operating out of my house as so-and-so blogger. I have a credibility issue, I have to make sure that what I’m saying is correct – or to the best of my ability – is correct. So it’s not just, “oh – that happened – let me write about it” – I have to figure out that it’s true before. So all of that has to happen in a very, very quick amount of time. The other thing we’re doing now is a lot of video. So we’re essentially becoming little videographers. When we go on interviews, we videotape them. When I go on set visits I film. Luber: So you personally hold the camera? Maria Elena Fernandez: I hold the camera – yeah – it’s a Flip camera. And I will – for example – my set visit to Dexter on Friday – would have been a simple hang out on set, a photographer would have come with me, I would have watched whatever was happening, I would have done some interviews, which I would record on a tape recorder, and then I would leave. Now I’m also thinking, what parts of these interviews I can break off for the blog, and what I can do in video. So like I’m going to do a behind-the-scenes tour on video for the blog, which is a lot more work! The video takes a long time to edit, to upload, so you’re basically doing a job that maybe 3 or 4 different people would have done. Now you’re doing it all by yourself. But that’s the reality of working in journalism today! That’s not just the LA Times – that’s everywhere! Luber: So you’re working harder and harder for probably the same pay. Luber: Which leads to my next question: What is pay like on this path and what can someone who’s coming right out of school expect? If they’re going to actually be able to fight their way into a job in journalism these days, what can they be looking at for a salary? Maria Elena Fernandez: Well this isn’t a job that people go into to become wealthy. But if you work in one of the larger markets like Los Angeles and New York or Chicago, you can make a pretty good salary once you get to a certain level. So for example, if you started off in Florida at a smaller market – not in South Florida but let’s say in Central Florida – you might graduate from school and be able to pull $30,000. But if you found several jobs after that that you kept moving – like let’s say you did what I did, which I moved from Florida to Atlanta to DC and then I moved out to LA. Each one of those affords you big pay bumps. And you could eventually be making 6-figures. It really depends on where you start. Because if you got lucky, like let’s say you got lucky and out of school maybe out of that Metpro program, let’s say you got a job at the LA Times – the person that started in Tampa, let’s say – that made $30,000 out here might start off at $55,000 or something like that. It’s not lucrative – it’s not something that you’re gonna say you’re rich on – but depending on how well your career goes and how big you go, you can make a pretty good living. Luber: That’s great – and then there’s always other ways to diversify too, I’m sure – if you wanted to write a book, or do other things, you can branch off. Maria Elena Fernandez: Right, which a lot of people do. Luber: Yeah – and also people could consider other than – like you’ve always worked at these major, big time newspapers – but – and there’s definitely less money, but if people want to write for their local community newspaper, or – there’s a lot of different paths within journalism that they could take. Maria Elena Fernandez: Yeah. And now there’s a lot of online jobs! Luber: Yes – absolutely. So give us some action plans. First give us an action plan for someone who’s done with school. I’m out of school and I want to do what you do. I want to be a journalist and I either want to do it as a career transition – like I’m doing something else right now and I want to become a journalist – maybe I’m a lawyer. Or I’m coming out of school and I just want to get in now. What would you advise me to do? Maria Elena Fernandez: Well if you’re coming out of school and you studied journalism, hopefully you have some internships under your belt. And you just start sending resumes. We used to photocopy newspaper clippings and mail them – now everything is done by email. But you’re basically sending samples of your work and your resume to as many employers as possible trying to get your first job. Luber: What if you’re in school and you haven’t yet – you’re just choosing your major, you’re kind of figuring things out. What would you advise that person? Maria Elena Fernandez: If you’re just figuring out that you want to study journalism, I say take as many journalism classes as possible, join the school paper, if there’s a good community paper in wherever you live that would hire you either as an intern or a freelancer so that you can get – the idea is to get as many clips as possible from a variety of sources – because that’s employment basically. That’s your proof that you can actually do the job out of school. Luber: And you are where you are now because you interned young and you got yourself out there and networked, right? Maria Elena Fernandez: Yes. My first job in Florida was a direct result of several – I actually didn’t have many internships. I had a job while I was in college. I worked at the school paper and at a community paper the entire time that I was there once I became a journalism major. From that I was able to get this job at the Sun Sentinel in Ft. Lauderdale and I was there 3 years. And then the other jobs out of state were as a result of having networked and met all these different recruiters over the years. Luber: So putting yourself out there and networking. 2 key things! Maria Elena Fernandez: Yeah – be very aggressive. You have to be very aggressive! Luber: That’s red magic marker territory, right? Everyone – take out your red magic markers and highlight that. You’ve gotta be aggressive, you’ve gotta get out there and you’ve gotta work it. Maria Elena Fernandez: Well to be a reporter you’ve gotta be aggressive, so that’s a good start right there! Luber: There ya go! Exactly! So give us some keys to success. Tie everything together for us with some keys to success for someone who wants to be just like you one day. Maria Elena Fernandez: The most important thing in establishing a journalism career, I think, is to actually be immersed in it some way – on your school level or on a community level. Write write write. Get a lot of different types of reporting experiences under your belt – whether it’s covering a city hall planning meeting or interviewing someone or going to a sports game and covering that so that your clips show that you can do a variety of reporting. Initially in your career, the most important thing is to show that you can do a lot of different things. Especially in this day and age with the internet and the videos and the blogging. Being as diverse as possible will make you that much more successful that much quicker. Being aggressive about employment is also seen as a big plus. Employers like people who seem confident and are not afraid to ask for things and are not afraid to present themselves to them. Like I said earlier, when I was young, I met a lot of people – they were completely out of my league – when I was 22, 23 years old I had no business talking to the editors of the Washington Post or the LA Times, but at these job fairs that was a great opportunity! And even though I knew I had nothing to offer them at the time, just to meet them – to get to know them on a personal level – made a big difference for me. They remembered me, they tracked my career, and when it was time, they came after me. So I think that perseverance, which is another quality that journalists have to have, because you often get doors shut on you when you’re trying to pursue a story – perseverance in terms of outlining a strategy for your own career is very very very important. It still, even though the newspaper industry everyone says newspapers are dying and all this stuff, I have to believe that there’s going to be some form of journalism whether it’s on the internet only or newspapers become something else. I think journalism is always gonna exist and it’s a very exciting and fulfilling profession where you get to – you get to remake yourself in this profession. I did news for a long time and I got tired….now I’ve been doing TV for a long time and maybe I’ll move on and do something else. But there’s so many different areas that you can choose from. Anything that you’re interested in, basically, you can write about as a journalist. So I highly recommend if you’re interested, I still think that it’s a viable profession. Luber: Excellent. Good advice. I hope everybody out there appreciates that you took your time. Thank you Maria Elena for sharing with us today. Maria Elena Fernandez: Thank you! Luber: Everybody – as always here at Careers Out There you get real advice from real professionals like Maria Elena Fernandez. Please share your feedback in the Comments section and don’t attack me or my mom like Maria Elena said people do on the LA Times site! We definitely want to hear from you – we hope that you learned a lot and if you have questions, let us know. We’ll be there to help you guys out. Thank you again for watching – I’m Marc Luber. Take care.